Satoko is a younger classmate in Keiichi's school. She has a distinctive style of speech, ending all of her sentences with 'wa' which, at times, is grammatically incorrect. 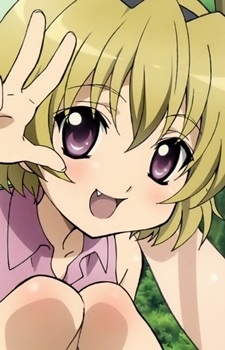 In spite of her young age, she is quite clever in setting up traps, and likes to practice on Keiichi. Although her personality is quite energetic and mischievous during the events of the games, Satoko's past was full of trauma; her parents died in an accident, she was abused by her foster parents (her aunt and uncle), and her beloved brother Satoshi disappeared. However, in Matsuribayashi-hen, Irie suggested she killed her parents, as she had a bad relationship with them and felt threatened, and so to her it was an act of self-defense. She is suffering from the Hinamizawa Syndrome at that time, and though Takano wanted to disect her alive for study, Irie fought to save her life. She is one of the few characters to ever recover from Level 5 of the Syndrome, but has to take shots on a regular basis. Though she greatly misses Satoshi, and feels that by being strong he will return, she comes to regard Keiichi as her new "nii-nii" (a cute term for older brother), and once even regards Shion as "nee-nee" (a cute term for older sister). She dislikes japanese pumpkin, and cannot tell the difference between cauliflower and broccoli, because she is colorblind.